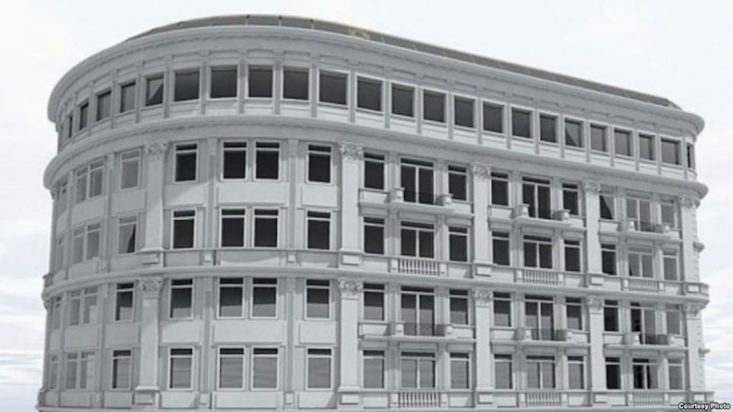 Despite significant public outcry, Skopje's modernist Paloma Bjanka business centre will become the latest building to get a faux-baroque facade as part of the controversial government-funded revamp of the Macedonian capital, Skopje 2014. In addition to criticism from members of the public, Trajko Dimitrov, the building's architect himself, has appealed to the authorities to keep Paloma Bjankas modernist glass and metal facade intact. “This revamp is irrational. It is a project intended to humiliate all living and deceased creators who designed these buildings and left their mark on the city. This is an architectural genocide,” Mr Dimitrov stated. Soon after the new facade was announced two years ago, the project drew criticism among members of the local population. “[With the new facades] they want to project power and imprint their legacy. But they fail to realise that by doing so they are destroying valuable buildings that have a historical context. This will depersonalise the city,” said local resident, 56-year-old Zarko Korunovski. While a preliminary design for the facade revamp has already been created by local architecture firm Arhitektonika, Skopje authorities recently made a call for an architecture studio to draw up a detailed plan for Paloma Bjanka by 25 August. After this date a construction firm will be chosen to carry out the work on the business centre, which was built in the late 1980s. According to a database established by the Balkan Investigative Reporting Network titled “Skopje 2014 Uncovered”, the city authorities have so far spent 41 million euro ($46.4 million) on putting such faux-baroque facades on old buildings in the centre of Skopje. The cost of Skopje’s new look has already risen sharply, far exceeding the initial figure of 80 million euros (approx. US$88 million) envisaged for the entire initiative when the project was announced in 2010. The project is now due to cost a total of 633 million euros (approx. US$695 million), and includes renovated buildings, new facades, sculptures, monuments and fountains.